This rich Collection of 8 watercolor art cards celebrates the fulfillment of the Feasts of Israel by Yeshua (Jesus) the Messiah. The artwork on the front of each card was designed to convey Old and New Testament truth. 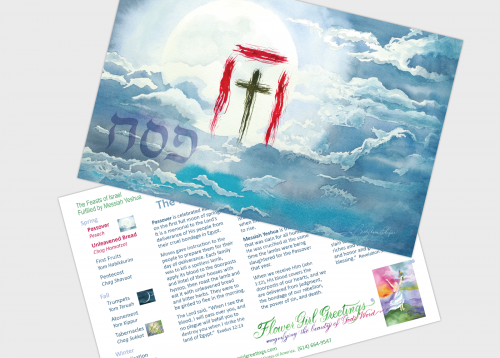 The back of each card includes the story behind each feast and Yeshua's fulfillment of the feast. The inside of each card includes the English and Hebrew names of each feast, Scripture references, the artist’s notes and a celebration greeting! Each Collection includes a colorful insert that explains the timeline of the feasts according to the Hebrew lunar calendar. Send an encouraging reminder of the love and deliverance we have through Yeshua.